On a cool and misty morning last September, Kirk Hanson and I visited Jackrabbit Farm in Southwest Washington. 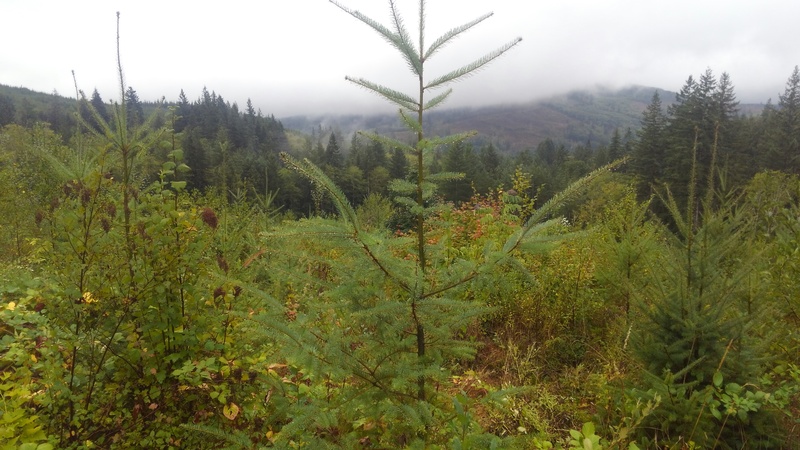 Kirk, Northwest Natural Resource Group’s Director of Forestry, needed to make observations and gather data for a new forest management plan for the farm, which had recently been funded through the USDA’s Environmental Quality Incentives Program (EQIP). My presence on this visit was due to my interest in “job shadowing” him on a site with elements of agroforestry and permaculture. Walking through the forest along intersecting paths, we used a variety of mapping tools to both record our route and any significant observations along the way. Handheld smartphones with external Bluetooth satellite receivers provide sufficiently precise mapping accuracy for the purposes of a forest management plan. Common phone apps, such as BackCountry Navigator, allow for easy mapping, and data can be readily uploaded to Google Earth for further analysis once back in the office. As we walked, observing and discussing along the way, Kirk offered advice on forest management techniques such as pre-commercial thinning to retain a mix of alder and fir, biodiversity and forest health, deer browse protection, natural succession, weed control, and so forth. Careen’s questions dwelt on integrating agroforestry practices, such as plant species and site selection; while Joel inquired about battling blackberry in riparian areas. The dialogue was a fun, interactive, and rich part of cultivating ideas to integrate into Jackrabbit Farm’s forest management plan. 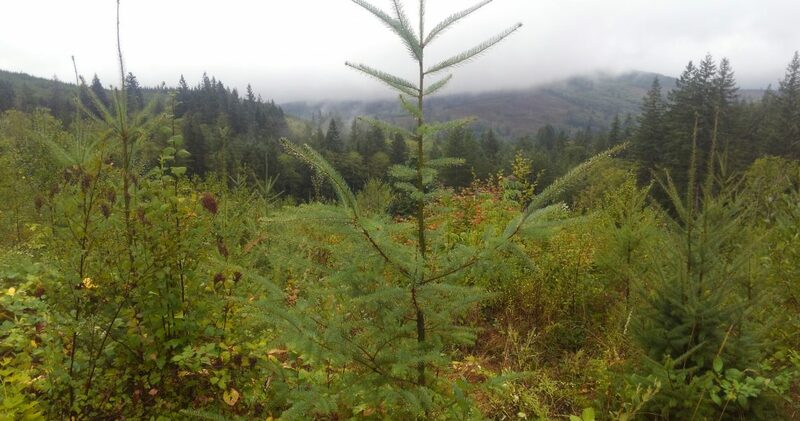 The riparian forest buffer zones and their restricted management areas presented numerous exciting opportunities for agroforestry practices, like the cultivation and harvest of Non Timber Forest Products (NTFP) or specialty forest products. One method for integrating a “food forest” system into managed forest is to observe the native edible plants within the riparian forest to determine which species naturally thrive there, then plant and cultivate similar species that have more desirable characteristics (e.g. larger berries) or are more productive. For instance, along the forest edge where native salmonberry (Rubus spp.) flourish, cultivated raspberry or blackberry varieties (Rubus spp.) can be grown as well to provide additional food variety and value. Extending this strategy, desirable native species that naturally occur within riparian areas, such as huckleberry, devils club, or willow, can easily be integrated into a management plan for the cultivation and production of NTFP. Growing edible and medicinal mushrooms is yet another option, and the dense red alder in the riparian areas lends itself to “high-stumping” and inoculation of the stumps with mycelium. With conscientious management, biodiverse riparian forests offer an abundance of opportunities for adding economic value to ecologically-protected areas. 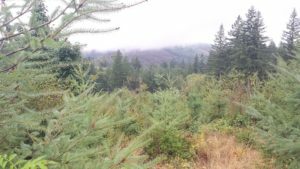 We popped out of the riparian forest buffer and into a clearing planned for the site where Joel, an environmental contractor-carpenter who grew up on a Swedish dairy farm in Minnesota, will build his net-zero energy dream house. The prevailing winds and misty breezes sweeping across this open space demonstrated the need for a hedgerow – yet another agroforestry system that employs multi-use plant species in several layers to produce a thick effective windbreak. We discussed how an effective hedgerow for this site could include, as its highest layer, a row of semi-dwarf apple trees that are inter-planted with filberts and sea buckthorn. Gooseberries and roses can comprise the shrub layer beneath the apples, and perennial medicinal and culinary herbs may lie amid a groundcover of nitrogen-fixing clover. By integrating wildlife forage and pollinator habitat into the design, the EQIP program could be a source of financial support for this productive and economically diverse windbreak hedgerow. 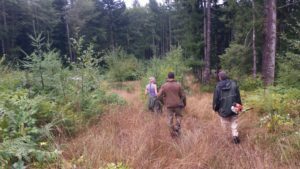 Walking through the fir/alder plantation brought into our conversation another agroforestry practice, silvopasture – or the integration and management of livestock within a tree plantation or forest. Carefully mixing grazing animals with trees offers additional economic opportunities while aiding in weed control and providing fertilizer for the trees. The Jackrabbit Farm tree plantation has several areas of ambitious weedy grasses and blackberries, currently controlled by a routine of costly weed-whacking expeditions. Alternatively, chickens, if introduced to the areas on a rotational schedule, could help keep the weeds down by eating blackberry sprouts and grass blades – all the while producing their nitrogen-rich manure, phosphorus-rich feathers, edible eggs, and eventually meat. A tractor can move a portable chicken coop through the forest as weed control is needed: an eco-friendly alternative to using herbicides and petroleum. As the trees mature and gain height, sheep can be introduced as another livestock option. At the end of our site walk, the management plan dialogue continued over a light snack of crackers, olives, veggies, and apples from the land, complements of the landowners! Kirk continued to offer guidance and resources, he advised particular forestry options that matched Careens interests and vision. We all shared stories, experiences, and resources as we enjoyed the sunny break in the weather, and then parted with friendly hugs and a sense of support on moving forward in the exciting realm of sustainable forestry.